My reading habbit has always been limited to small articles in Newspapers and magazines. Books has always been a nightmare to me. I have never read a single book completely!!! 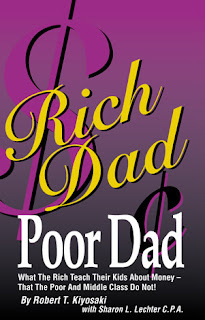 Yesterday, when chatting with one of my friends, he referred a book "Rich Dad, Poor Dad" by Robert Kiyosaki. He said this is one of the best-selling books even after almost 7 years. The way my friend spoke about this book created some interests in me. Today, while browsing the Internet after the day's work, I went to wikipedia to read more about this book. My friend must be right. "Physical exercise improves health, mental exercise improves wealth, laziness destroys both." "A true luxury is a reward for investing in and developing a real asset." "The only way to get out of the "Rat Race" is to prove your proficiency at both accounting and investing, arguably two of the most difficult subjects to master." "I have mentioned before that financial intelligence is a synergy of accounting, investing, marketing and law. Combine those four technical skills and making money with money is easier." "Most people are poor because when it comes to investing, the world is filled with Chicken Littles running around yelling, ‘The sky is falling. The sky is falling.’"
"Many of today's youth have credit cards before they leave high school, yet they have never had a course in money or how to invest it, let alone understand how compound interest works on credit cards." Very short yet highly motivating messages!!! I guess the book should be more interesting.